DePaul Prof. Juan Mora-Torres speaks to an audience at Evanston Public Library. At a documentary screening and discussion on Saturday, Mora-Torres argued that U.S. arms sales to Mexico reinforce endemic corruption within the Mexican government and exacerbate the drug war. A group of Evanston residents and Chicago-based activists gathered Saturday for a discussion on government corruption, arms sales and the drug war in Mexico. Nearly 30 people attended the event, which was held at the Evanston Public Library and began with a screening of “Where the Guns Go,” a documentary detailing how United States-produced firearms contribute to cartel and other violence. The 26-minute film presented testimonies from victims of crime and included interviews with academics from Mexico and the United States. 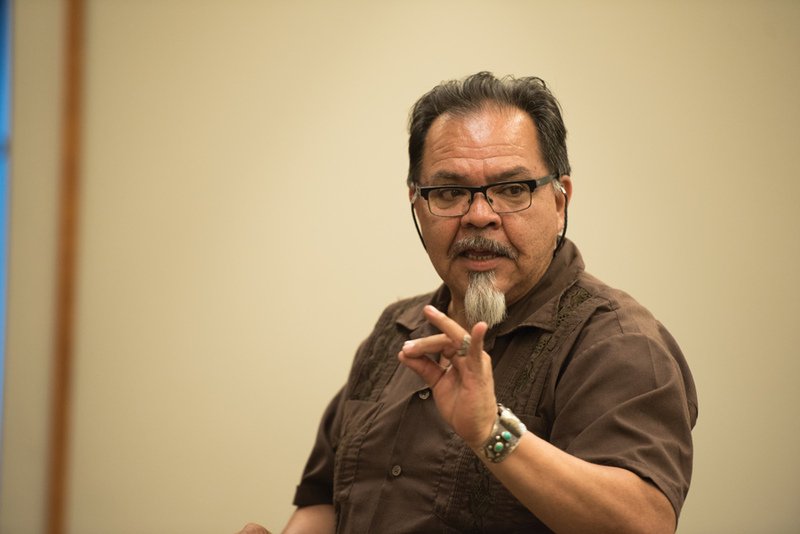 Following the film, Juan Mora-Torres, a history professor at DePaul University, discussed the subject, saying the Merida Initiative — a 2007 security agreement between the U.S. and Mexico — has exacerbated the drug war by pouring weapons into a corrupt system. Since fiscal year 2008, the U.S. Congress has appropriated $2.5 billion for the Merida Initiative, which includes assistance to the Mexican police and military, according to the U.S. State Department. Mora-Torres and Justicia en Ayotzinapa, a Chicago-based organization that sponsored Sunday’s event, also discussed a 2014 kidnapping of 43 college students in Iguala, Mexico. The abductions generated protests in Mexico and throughout the world, and they have become a symbol of state dysfunction and a political catastrophe for Mexican President Enrique Peña-Nieto, Mora-Torres said. After Mora-Torres’ lecture, the room opened up to questions and comments from the audience. Attendees, who expressed anger about U.S. foreign policy in general, largely agreed with Mora-Torres’ analysis of the situation in Mexico, with many reiterating the importance of controlling firearms and enforcing accountability. One of the central questions brought up by residents was the level of culpability the U.S. government has in the Mexican drug war. Laura Paz, a Chicago resident and volunteer for Justicia en Ayotzinapa, said the U.S. plays a central role in perpetuating violence in Mexico. Attendees did not directly respond to her claims, but some disagreed that the primary responsibility lay with the United States government. Miguel Angel Flores, an attendee who was born in Mexico City, emphasized the importance of internal reform efforts. Flores said the Mexican people had the power to change the situation for better or for worse. “It’s sad to say, we have the government we elected,” Flores said. A previous version of the caption on this story misstated when Juan Mora-Torres spoke at the Evanston Public Library. Mora-Torres spoke at EPL on Saturday. The Daily regrets the error.